6.45PM: Pre-concert talk with Margarida Castro (RSNO Associate Principal Double Bass) in the Upper Circle Bar. 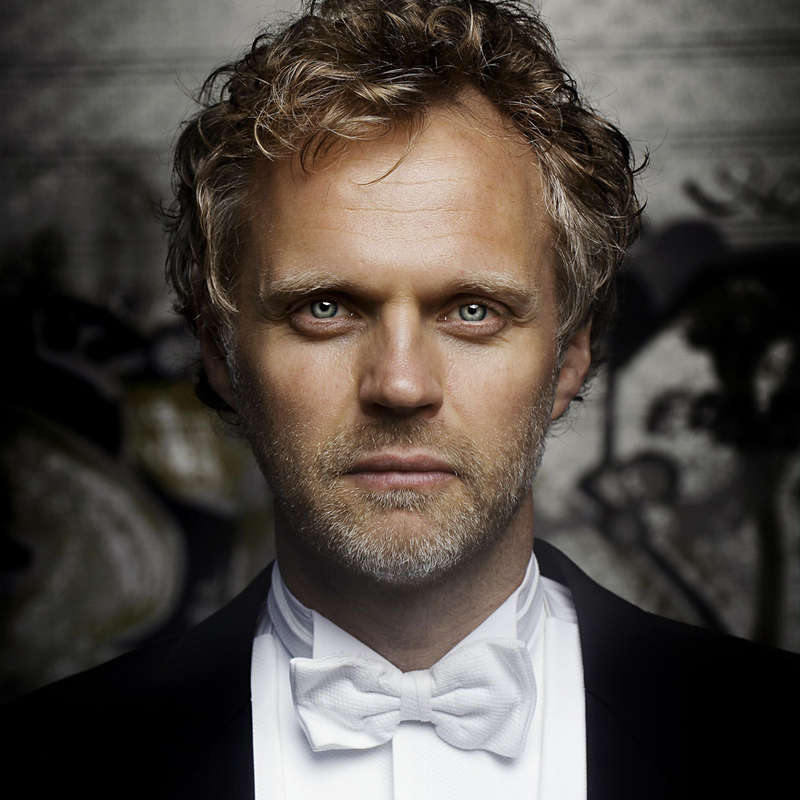 Danish conductor Thomas Søndergård is Music Director of the Royal Scottish National Orchestra, after six seasons as Principal Guest Conductor. He served as Principal Conductor of BBC National Orchestra of Wales (BBCNOW) from September 2012 – August 2018, and prior to this, as Principal Conductor and Musical Advisor of the Norwegian Radio Orchestra for three seasons. Thomas has conducted many leading orchestras, including London Philharmonic Orchestra, BBC Symphony, Royal Concertgebouw Orchestra, London Symphony Orchestra, Philharmonia Orchestra, Oslo Philharmonic Orchestra, Göteborgs Symfoniker, Danish National Symphony Orchestra, Royal Stockholm Philharmonic and Gewandhausorchester Leipzig, WDR Sinfonieorchester Köln, Deutsches Symphonie-Orchester Berlin, Mahler Chamber Orchestra, Bamberger Symphoniker; leading tours with Junge Deutsche Philharmonie and European Union Youth Orchestra; Rotterdam Philharmonic Orchestra, Nederlands Philharmonisch Orkest, Orchestre Philharmonique du Luxembourg, Brussels Philharmonic; Swedish Radio Symphony Orchestra, Orchestre National d’Ile de France; Toronto Symphony Orchestra, Atlanta Symphony Orchestra, Vancouver Symphony Orchestra, Houston Symphony and Seattle Symphony Orchestra. The 2018/19 season includes his debuts with Chicago Symphony Orchestra joined by Alexander Gavrylyuk, New Zealand Symphony Orchestra, Helsinki Philharmonic Orchestra, Orchestre National de France and Tapiola Sinfonietta. He makes return visits to Atlanta Symphony Orchestra, Toronto Symphony Orchestra, BBC National Orchestra of Wales, Danish National Symphony Orchestra, the orchestra of the Royal Danish Academy Copenhagen, Swedish Radio Symphony Orchestra, Bayerische Staatsoper (Turandot) and Deutsche Oper Berlin (Berlioz’s Romeo and Juliet). Plans with RSNO include tours to China and the United States, premieres of new commissions and Marsalis’ Violin Concerto with Nicola Benedetti. Recent highlights include debuts with Rundfunk Sinfonieorchester Berlin, Bern Symphony Orchestra, Gurzenich-Orchester Köln, SWR Baden-Baden, Orchestre Philharmonique de Strasbourg and return visits to Sydney Symphony Orchestra, Orchestre National du Capitole de Toulouse and the revival of The Magic Flute with Norwegian Opera. A passionate supporter of the music of Carl Nielsen, his most recent programme with Swedish Radio Symphony Orchestra (Symphony No. 5) received wide praise as “equal of the great pioneers of Nielsen interpretation… It’s harder to imagine a finer performance of this remarkable symphony” (Dagens Nyheter). As part of the 2015 anniversary celebrations of both Sibelius and Nielsen he conducted a wide variety of works by these two composers with many leading orchestras. In 2019 he will participate in a special concert to celebrate Nielsen’s work with the Royal Danish Academy of Music Copenhagen. Thomas is also an experienced opera conductor at home in mainstream and contemporary repertoire. Previous opera includes Bayerische Staatsoper (Turandot), Norwegian Opera (Die Zauberflöte), Deutsche Oper Berlin (world premiere of Scartazzini’s Edward II) and Tosca, Turandot (Nina Stemme) and Les dialogues des Carmelites for Kungliga Operan (Royal Swedish Opera). He was described as “a sensation” at his debut with the Royal Danish Opera conducting Ruders' opera Kafka's Trial: "He is one of the best things that has happened to the art of opera for many years" and subsequent productions there have included Il barbiere di Siviglia, Le Nozze di Figaro, La bohème, Cunning Little Vixen and Il viaggio a Reims. Releases with BBCNOW include Sibelius Symphonies 1, 2, 6 & 7 and most recently a disc which shines light on Sibelius’ tone poems and theatre music, featuring Finlandia and Valse Triste (Linn Records). Other noteworthy recordings include Vilde Frang's celebrated first recording for EMI, and Ruders’ Piano Concerto No. 2 on Bridge Records which was nominated for a Gramophone Award in 2011. In 2011 he was awarded the prestigious Queen Ingrid Foundation Prize for services to Music in Denmark. Due for release shortly are the Lutoslawski and Dutilleux cello concertos with Johannes Moser and Rundfunk Sinfonieorchester Berlin for Pentatone. Nicola Benedetti is one of the most sought-after violinists of her generation. Her ability to captivate audiences with her innate musicianship and spirited presence, coupled with her wide appeal as a high-profile advocate for classical music, has made her one of the most influential classical artists of today. With concerto performances at the heart of her career, Nicola is in much demand with major orchestras and conductors across the globe. Conductors with whom Nicola has worked include Vladimir Ashkenazy, Jir?i´ Be?lohla´vek, Ste´phane Dene`ve, Christoph Eschenbach, James Gaffigan, Hans Graf, Valery Gergiev, Alan Gilbert, Jakub Hruša, Kirill Karabits, Andrew Litton, Kristjan Ja¨rvi, Vladimir Jurowski, Cristian Ma?celaru, Zubin Mehta, Andrea Marcon, Peter Oundjian, Vasily Petrenko, Donald Runnicles, Thomas Søndergård, Krzysztof Urbanski, Juraj Valcua, Edo de Waart, Pinchas Zukerman and Jaap van Zweden. Nicola enjoys working with the highest level of orchestras including collaborations with the London Symphony Orchestra, London Philharmonic Orchestra, New York Philharmonic, National Symphony Orchestra of Washington D.C., Orchestra of the Mariinsky Theatre, Leipzig Gewandhausorchester, Frankfurt Radio Symphony, Camerata Salzburg, Czech Philharmonic, Danish National Symphony Orchestra, Los Angeles Philharmonic, San Francisco Symphony and the Chicago Symphony at the Ravinia Festival. The Summer of 2018 saw Nicola make her debut at the Philharmonie de Paris with Karina Canellakis and the Orchestre de Paris. She returned to the BBC Proms with Andrew Gourlay and the BBC Concert Orchestra to celebrate the 40th Anniversary of the BBC Young Musician. In addition, Nicola returned to Edinburgh to perform at the Edinburgh International Festival twice: with Marin Alsop and the Baltimore Symphony Orchestra, and with Richard Egarr and the Academy of Ancient Music. This 18/19 season Nicola makes her second appearance with the Royal Stockholm Philharmonic and collaborates with the BBC Symphony Orchestra, Chicago Symphony, Lucerne Symphony Orchestra, Royal Scottish National Orchestra, Orchestre National du Capitole de Toulouse, Orchestre de Bretagne, Seattle Symphony, San Francisco Symphony, Frankfurter Museumsorchester, Toscanini Orchestra and Philharmonia Orchestra with Pablo Heras-Casado. She will also undertake tours with the Scottish Chamber Orchestra performing Mozart Violin Concertos and with the National Youth Orchestra of Great Britain performing the Bruch Violin Concerto. With her regular duo partner pianist Alexei Grynyuk, Nicola frequently performs recitals in the world’s leading concert halls and festivals with most recent highlights including Wigmore Hall, Concertgebouw Amsterdam, Utrecht, Rome, Copenhagen, Dortmund, Ludwigshafen, Bielefeld and Kiel. Nicola is also a devoted chamber musician and collaborates with cellist Leonard Elschenbroich and pianist Alexei Grynyuk, who have been performing as a trio since 2008. Recent performances include London’s Cadogan Hall, Amsterdam Concertgebouw, Birmingham Symphony Hall, Edinburgh Festival, Glasgow Royal Concert Hall, Frankfurt Alte Oper, Ravinia Festival, New York’s 92nd Street Y and Hong Kong City Hall. In November 2018 the trio embarks on a month-long Australian tour giving 9 performances in 7 cities. Over the last 12 months Nicola has also continued her role as a dedicated, passionate ambassador and leader in music education. She has reached over 1250 young people through workshops, masterclasses, partnership projects, and school visits, providing key moments of inspiration for young instrumentalists, as well as focused, high quality teaching and guidance. Nicola has also connected with over 100 teachers, aiming to support their practice, highlight their essential role in society - especially during a period when many jobs have been under threat - and encourage collaboration and mutual learning. This commitment to supporting the UK's music practitioners was underlined in July, when Nicola took over as President of the European String Teachers Association. Nicola continues to hold key positions in a number of the country's most established and high-quality youth music organisations including the National Children's Orchestra (Vice President), Sistema Scotland (Big Sister), National Youth Orchestras of Scotland's Junior Orchestra (Patron), Music in Secondary Schools Trust (Patron), Junior Conservatoire at the Royal Conservatoire of Scotland (Patron) and many more. Through all these events and partnerships, Nicola aims to tackle the paradox that faces all young players; how to balance the perseverance and discipline required to master technical challenges with the consistent passion, love, and freedom of expression that is the impetus of all the most powerful music-making. This is an idea that will also feature in a key 2018 project - Super Strings Sessions with Sistema Scotland - which will see Nicola work directly with 500 young people in events across four different cities. Winner of Best Female Artist at both 2012 and 2013 Classical BRIT Awards, Nicola records exclusively for Decca (Universal Music). Her most recent recording of Shostakovich & Glazunov Violin Concertos has been met with critical acclaim. Richard Morrison of The Times maintains that “this riveting performance of Shostakovich’s First Violin Concerto is Nicola Benedetti’s best recording to date.” Her past seven recordings on Universal/Deutsche Grammophon include a varied catalogue of works from Szymanowski Concerto (London Symphony Orchestra/Daniel Harding) to Homecoming; A Scottish Fantasy, which made Nicola the first solo British violinist since the 1990s to enter the Top 20 of the Official U.K. Albums Chart. Nicola attracts an enormous amount of worldwide media attention following the various facets of her extraordinary career and her international television appearances have been wide and varied including performing at the Opening Ceremony of the 2014 Commonwealth Games to a live audience of approximately 40,000 and TV viewing audience of 9.4 million people. Nicola was appointed a Commander of the Order of the British Empire (CBE) in the 2019 New Year Honours List, awarded the Queen’s Medal for Music in 2017, the youngest ever recipient, and was appointed as a Member of the Most Excellent Order of the British Empire (MBE) in 2013 in recognition of her international music career and work with musical charities throughout the United Kingdom. In addition, Nicola has received eight honorary degrees to date. Born in Scotland of Italian heritage, Nicola began violin lessons at the age of five with Brenda Smith. In 1997, she entered the Yehudi Menuhin School, where she studied with Natasha Boyarskaya. Upon leaving, she continued her studies with Maciej Rakowski and then Pavel Vernikov, and continues to work with multiple acclaimed teachers and performers. Nicola plays the Gabriel Stradivarius (1717), courtesy of Jonathan Moulds.